A Microsoft employee who snapped a photo of Steve Ballmer at a company meeting was given a ribbing by the company executive; and the first iTunes LP e-book is for sale in the form of a comic with multimedia extras. At a private company meeting this week, Microsoft CEO Steve Ballmer was reportedly giving one of his legendary energetic entrances when an employee mistakenly snapped a photo of him with an iPhone. According to Todd Bishop at TechFlash, the company leader made a lighthearted example of him. "Ballmer grabbed the Apple device from the employee and made some funny remarks as everyone booed," he said. "Then he put it on the ground and pretended to stomp on it, before walking away." Ballmer reportedly teased the employee again later during his presentation. Bishop noted that one Microsoft employee remarked on Twitter: "You just don't pick up the CEO of Chevy in a BMW." While those in attendance said the moment was all in good fun, Ballmer has made his share of inflammatory remarks about the iPhone in the past. However, since the iPhone has proven successful for Apple, Ballmer has softened his remarks. 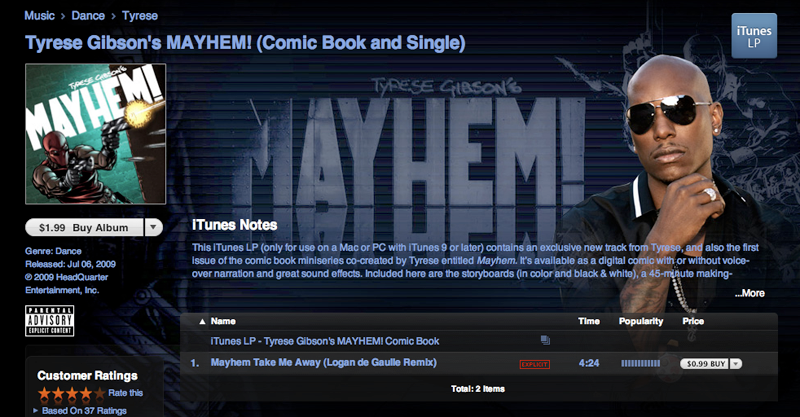 Tyrese Gibson's "Mayhem" is the first digital book for sale as an iTunes LP. The $1.99 album features a comic book co-created by Tyrese, as well as an exclusive track from the artist. In addition, it includes a 45-minute "making of" video, two additional exclusive comics, black-and-white storyboards, alternate covers, concept art, desktop wallpapers and more. After he saw the product at Apple's event this week, Fortune's Jon Fortt asked whether the product is Apple's e-book "trojan horse." "And its not just text and images; both audio and video come along with the package," Fortt said. "The interface is designed so that it would obviously work nearly as well on a touch-sensitive tablet  or even on an iPhone  as it does on a full-fledged PC." Unveiled this week, iTunes LP was originally believed to be a product intended to spur sales of whole albums, rather than singles. While that intent may be true, the "Mayhem" comic suggests that iTunes LP could come to represent much more than music, but a unique combination of multimedia offerings combined in one package.